The price of Ethereum topped $200 and continued marching forward. Vitalik Buterin, the brain behind the world’s No. 1 Altcoin, said that Ethereum’s path to “Serenity” is “really no longer so far away.” The founder’s hopes, voiced at a conference in Prague, sent the ETH/USD higher. What levels should we watch? The Technical Confluence Indicator shows that Ethereum faces an initial hurdle at $212 which is the convergence of the Bollinger Band 4h-Upper, the Fibonacci 161.8% one-week, the Simple Moving Average one-day, the Fibonacci 23.6% one-day, and the BB 1h-Upper. The next cap is $219, where we see yesterday’s high, the Pivot Point one-week Resistance 3, and the PP one-day R1. It is followed by $226 which is the PP one-month R1, but the ultimate target is $235 which was last month’s high. 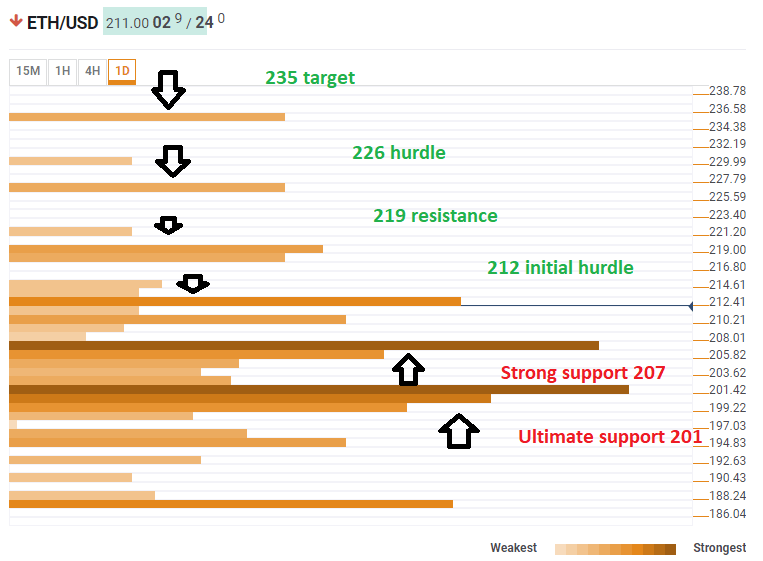 Looking down, support awaits at $207 where we see a dense cluster of levels including the BB 1h-Lower, the PP 1W-R1, the Fibonacci 38.2% one-month, the SMA 10-4h, and the Fibonacci 61.8% one-day. The most substantial level of support is $201 where we see last year’s low, the SMA 10-one-day, the SMA 5-one-day, the Fibonacci 61.8% one-week, the SMA 200-1h, the SMA 50-4h, and the PP one-day S1. All in all, the path of least resistance is up.